Polymorphisms in the gene encoding sterile 20/SPS1-related proline/alanine-rich kinase (SPAK) associate with hypertension susceptibility in humans. SPAK interacts with WNK kinases to regulate the Na+-K+-2Cl− and Na+-Cl− co-transporters [collectively, N(K)CC]. Mutations in WNK1/4 and N(K)CC can cause changes in BP and dyskalemia in humans, but the physiologic role of SPAK in vivo is unknown. We generated and analyzed SPAK-null mice by targeting disruption of exons 9 and 10 of SPAK. Compared with SPAK+/+ littermates, SPAK+/− mice exhibited hypotension without significant electrolyte abnormalities, and SPAK−/− mice not only exhibited hypotension but also recapitulated Gitelman syndrome with hypokalemia, hypomagnesemia, and hypocalciuria. In the kidney tissues of SPAK−/− mice, the expression of total and phosphorylated (p-)NCC was markedly decreased, but that of p-OSR1, total NKCC2, and p-NKCC2 was significantly increased. We observed a blunted response to thiazide but normal response to furosemide in SPAK−/− mice. In aortic tissues, total NKCC1 expression was increased but p-NKCC1 was decreased in SPAK-deficient mice. Both SPAK+/− and SPAK−/− mice had impaired responses to the selective α1-adrenergic agonist phenylephrine and the NKCC1 inhibitor bumetanide, suggesting that impaired aortic contractility may contribute to the hypotension of SPAK-null mice. 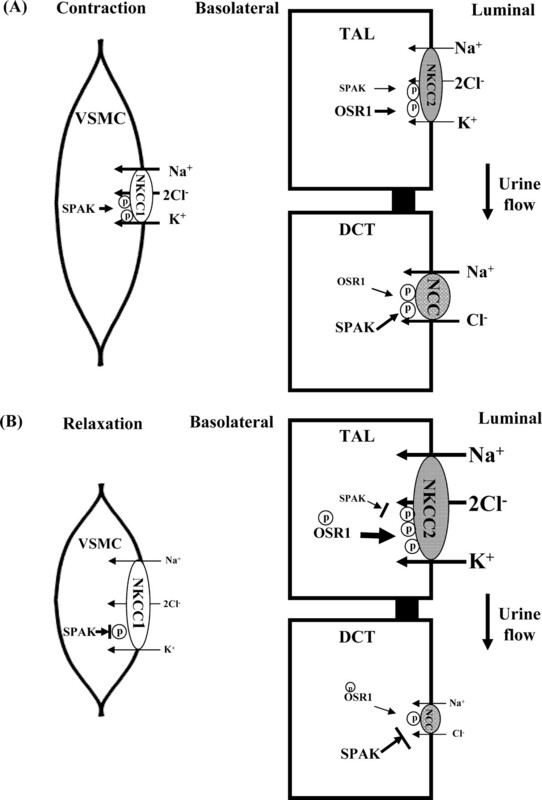 In summary, SPAK-null mice have defects of NCC in the kidneys and NKCC1 in the blood vessels, leading to hypotension through renal salt wasting and vasodilation. SPAK may be a promising target for antihypertensive therapy. Gene mutations of the NCC in the distal convoluted tubules (DCTs) and NKCC2 in the thick ascending limb of the loop of Henle (TAL) cause autosomal recessive Gitelman syndrome (GS)12 and Bartter syndrome (BS),13 respectively. These congenital renal tubular disorders are characterized by renal salt-losing hypotension, secondary hyperreninemia and hyperaldosteronism, and hypokalemic metabolic alkalosis; however, mutations in the WNK1 and WNK4 genes cause autosomal dominant pseudohypoaldosteronism type II (PHAII) featuring the mirror image of GS,14,15 with salt-sensitive hypertension, low plasma renin activity and inappropriately high plasma aldosterone level, and hyperkalemic metabolic acidosis. A recent human study also showed that genetic variations in the intron regions of STK39, the gene encoding SPAK, could enhance its expression and increase susceptibility to hypertension.16 These findings suggest that SPAK and OSR1 play important roles in BP and renal tubular electrolyte regulation. We previously found that phosphor (p-) but not total SPAK and OSR1 were increased along with increased total and p-NCC expression in kidneys of WNK4D561A/+ knock-in mice, recapitulating human PHAII.17 Conversely, a WNK4 hypomorphic mouse (by targeting disruption of exon 7 whereby the PHAII-causing mutations are clustered) clearly showed hypotension and decreased expression of p-SPAK/OSR1 and p-NCC.18 These and other previous findings further reiterate the importance of the WNK4-SPAK/OSR1-NCC pathway in the pathogenesis of PHAII. Because SPAK and OSR1 share high homology in both their catalytic and regulatory domains and their expression in tissues often overlaps, it is crucial to tease apart the role of each kinase. The generation and analysis of individual SPAK- or OSR1-deficient mice may provide better platforms to study this issue. For this purpose, we generated SPAK- and OSR1-null mice by disrupting exons 9 and 10 of the Stk39 (SPAK) and Oxsr1 (OSR1) genes, respectively. Homozygous OSR1-null mice died in utero as in the recently reported OSR1 gene–trapped mice.19 We therefore analyzed the SPAK (Stk39)-null mice to investigate its role in the kidneys and blood vessels. Results to be reported indicate that SPAK−/− mice exhibited not only hypotension but the phenotype of GS. To generate SPAK-null mice, we designed a vector to delete exons 9 and 10 of Stk39 gene (Figure 1A) and 20 homologous recombination embryonic stem (ES) cells were confirmed by Southern blotting (Figure 1B). The neo cassette was excised by transfecting the Flp-expression plasmid into the selected targeted ES cells. We obtained three chimeric mice from two different SPAKflox/+ clones and crossed them with C57BL/6 mice to produce SPAKflox/+ progeny (Figure 1A). The SPAK▵exon 9,10/+ mice were then generated by crossing SPAKflox/+ with CAG-Cre recombinase transgenic mice.20 SPAK▵exon 9,10/▵exon 9,10 mice were generated by mating SPAK▵exon 9,10/+ littermates with each other, and the genotype of the offspring was verified by PCR amplification (Figure 1C). We did not find full-length or estimated hypomorphic (approximately 60 kD) SPAK proteins in either kidneys (Figures 1D and 2A) or aortic tissue, confirming that the SPAK protein was not expressed in SPAK▵exon 9,10/▵exon 9,10 mice. Hereafter, SPAK+/− and SPAK−/− are used to represent heterozygous (He) and homozygous (Ho) disrupted exons 9 and 10 of Stk39 gene (SPAK-null) mice, respectively. Because there was no difference in gross appearance and phenotype between D7 and D10 SPAK-null mice strains, the D7 mice were adopted in this study. SPAK+/− and SPAK−/− mice grew normally and were indistinguishable from wild-type (WT) control littermates in appearance, behavior, and fertility. The disruption of exons 9 and 10 of the Stk39 gene creates SPAK-null mice. (A) Targeting strategy for generating SPAK-null mice. The diagram shows the WT Stk39 locus encoding SPAK, the targeting construct, and the targeted locus before (flox) and after recombination by Flp (FRT) and Cre (▵exon 9, 10) recombinase. (B) Verification of homologous recombination by Southern blotting of EcoRI-digested genomic DNA derived from the selected ES cells (D7 and D10) before deleting neomycin transferase (neo) cassette. The 6.0-kb band derives from the WT allele, and the 7.5-kb band derives from the flox allele. C, control genomic DNA from WT ES cells. (C) Genomic DNA derived from tails of SPAK-null mice was used as template, and primers flanking the remaining loxP site (arrow) were used for genotyping. The 189-bp band represents the targeted allele (▵exon 9 and 10), whereas the 1147-bp band represents the WT allele. C, control genomic DNA from mice. (D) Representative SPAK (arrow) and OSR1 (dashed arrow) protein expression in whole-kidney tissues of WT, SPAK+/− (He), and SPAK−/− (Ho) mice. SPAK-null mice have reduced total and p-SPAK, total and p-NCC but increased p-OSR1 and p-NKCC2 expression in kidney tissues. (A through D) Semiquantitative immunoblotting (top) and densitometry (bottom) of total and p-SPAK (A), total and p-OSR1 (B), total and p-NCC (T53, T58, and S71; C), and total and p-NKCC2 (T96; D) in kidney tissues from WT, SPAK+/− (He), and SPAK−/− (Ho) mice (n = 4 per group). *P < 0.05 versus WT; ●P < 0.05 in He versus Ho. First, we focused on BP and electrolyte homeostasis in the SPAK-null mice. As shown in Table 1, SPAK−/− mice had relative hypotension (P < 0.05) and secondary hyperaldosteronism (P < 0.05). SPAK−/− mice also exhibited a significant decrease in plasma K+ concentration (P < 0.05) with increased fractional excretion of K+ (FEK; P < 0.05), hypomagnesemia (P < 0.01) with increased fractional excretion of Mg2+ (FEMg; P < 0.05), and hypocalciuria [Ca2+/creatinine 0.12 ± 0.02 versus 0.19 ± 0.03 mg/mg (n = 10; P < 0.01). The failure to develop quite hypokalemia (approximately 3.6 mmol/L) in SPAK−/− mice may be due to their high K+ intake per kilogram of body mass (Table 1). Nevertheless, these renal phenotypes resemble the typical clinical features of patients with GS.12,21 Conversely, SPAK+/− mice exhibited only relative hypotension (P < 0.05) without significant differences in serum and urine electrolytes, compared with WT controls (Table 1). It has been reported that SPAK is distributed in the TAL and DCT16; however, SPAK−/− mice displayed a GS phenotype corresponding to a DCT lesion with hypocalciuria rather than BS physiology (a TAL lesion with normal-hypercalciuria),22 suggesting predominant distribution and expression of SPAK in DCT. By immunofluorescence (IF) stain in the kidney tissue of WT mice, SPAK was expressed in both the cortex dominantly with co-localization with NCC-positive segment (DCT; Supplemental Figure S1A) and medulla overlapped with NKCC2-positive segment (TAL; Supplemental Figure S1B). OSR1 was widely distributed in the cortex and medulla, including DCT and TAL segments (Supplemental Figure S1C). To examine the effect of SPAK deletion on NCC expression, we measured the relative levels of total and p-SPAK and NCC in the kidney tissues by semiquantitative immunoblotting. The lack of total SPAK and p-SPAK (Figure 2A) with markedly reduced total NCC (42 ± 6%; P < 0.01) and p-NCC (T53 [50 ± 10%], T58 [24 ± 4%], and S71 [37 ± 8%]; P < 0.01) was observed in SPAK−/− mice (Figure 2C). To determine whether the expression of total OSR1 and p-OSR1 was affected in SPAK−/− mice, we also looked at total OSR1, p-OSR1, total NKCC2, and p-NKCC2 (T96; another possible SPAK/OSR1 phosphoacceptor site23). Although total OSR1 expression was not changed, p-OSR1 (193 ± 22%; P < 0.01; Figure 2B), total NKCC2 (230 ± 26%; P < 0.01) and p-NKCC2 (T96; 460 ± 37%, P < 0.01; Figure 2C) expression were significantly increased. In the SPAK+/− mice, the expression of SPAK, p-SPAK (Figure 2A), total NCC (80 ± 9%; P < 0.05), and p-NCC (T53 [69 ± 18%], T58 [65 ± 14%], and S71 [65 ± 16%]; P < 0.01; Figure 2C) were significantly reduced, but the expression of p-OSR1 (188 ± 28%; P < 0.01; Figure 2B), NKCC2 (132 ± 14%; P < 0.01), and p-NKCC2 (T96; 221 ± 45%; P < 0.01; Figure 2D) was significantly increased, compared with WT controls. We also examined the cellular localization and expression of SPAK, NCC, and NKCC2 in the kidney tissue of SPAK-null mice. The results of IF were consistent with those observed by immunoblotting. As expected, SPAK expression was absent in NCC-positive segment (DCT) in SPAK−/− mice (Supplemental Figure S1A; Figure 3, top right). The cellular distribution of p-NCC (T58) was still luminally condensed but significantly less in both SPAK+/− and SPAK−/− mice (Figure 3, bottom). Nevertheless, the cellular localization of total NKCC2 and p-NKCC2 (T96) in the TAL was luminally condensed in SPAK+/− and SPAK−/− mice (Supplemental Figure S2). 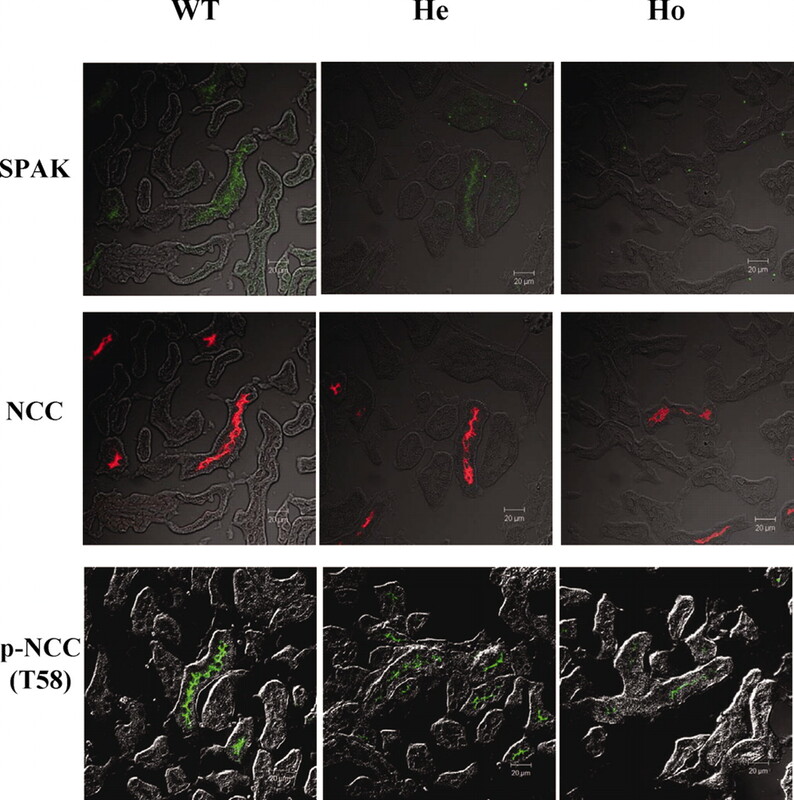 SPAK-null mice have reduced total SPAK, total and p-NCC in kidney tissues by IF stain. Representative IF micrographs of SPAK (top), NCC (middle), and p-NCC (T58; bottom) in the cortex of WT, SPAK+/− (He), and SPAK−/− (Ho) mice. Bar = 20 μm. We administered hydrochlorothiazide (HCTZ; NCC inhibitor) and furosemide (NKCC2 inhibitor) to determine the NCC and NKCC2 function in these SPAK-null mice. The resulting urine output and Na+, K+, and Cl− excretion rates were used as an index of NCC and NKCC2 function in response to their inhibitors. Like WT controls, urine amount, FENa, FEK, and FECl were markedly increased after a single dose of HCTZ treatment in SPAK+/− mice, suggesting that NCC function was still preserved in SPAK+/− mice. Compared with WT and SPAK+/− mice, SPAK−/− mice had a significant decrease in urine amount, FENa, and FECl, supporting that their NCC function was severely diminished (Figure 4A). For NKCC2 function, urine output, FENa, FEK, and FECl after a single dose of furosemide administration were significantly increased to a similar extent among WT, SPAK+/−, and SPAK−/− mice (Figure 4B), suggesting that NKCC2 function was still intact in SPAK+/− and SPAK−/− mice. SPAK-null mice show blunted response to HCTZ but normal response to furosemide (FURO). FENa, FEK, and FECl represent the fractional excretion of Na+, K+, and Cl−, respectively. (A) Response of urine output, FENa, FEK, and FECl was increased both in WT (♦) and SPAK+/− (He, ▴) mice but blunted in SPAK−/− (Ho, ■) mice after HCTZ treatment. (B) All of the WT, SPAK+/−, and SPAK−/− mice had similar diuretic, FENa, FEK, and FECl response to FURO treatment. *P < 0.05 in WT versus Ho; ●P < 0.05, He versus Ho mice (n = 8 per group). Because SPAK and NKCC1 are coexpressed in vascular smooth muscle and NKCC1 activity is known to play an important role in regulation of aortic contractility and BP,24,25 we examined whether this pathway could be involved in the hypotension of SPAK-null mice. The relative protein expression of total and p-SPAK/NKCC1 in the aortic tissues of SPAK-null mice were examined. Total SPAK and p-SPAK expression were absent in aortic tissues, akin to the kidneys (Figure 5A). Of interest, we found increased, rather than decreased, total NKCC1 expression in aortic tissues. Nevertheless, the functional p-NKCC1 (T206) was significantly decreased in SPAK+/− and SPAK−/− mice, compared with WT controls (Figure 5B). SPAK-null mice have reduced total SPAK, p-SPAK and p-NKCC1 but increased total NKCC1 expression in aortic tissues. (A and B) Semiquantitative immunoblotting (top) and densitometry (bottom) of total and p-SPAK NKCC1 in aortic tissues from WT, SPAK+/− (He), and SPAK−/− (Ho) mice (n = 4 per group). *P < 0.05 versus WT; ●P < 0.05 versus He. To investigate whether the decreased p-NKCC1 (T206) contributed to vasodilation, we evaluated aortic contractility in the SPAK-null mice. The concentration-force relationships for aortic rings of WT controls, SPAK+/− mice, and SPAK−/− mice after stimulation with phenylephrine (PE; a selective α1-adrenergic agonist) either in absence or presence of 10 μM bumetanide (an NKCC1 inhibitor) were examined.24 Without bumetanide, both SPAK+/− and SPAK−/− mice were significantly less responsive to PE stimulation compared with WT control (PE concentration 10−6 to 10−4 M; Figure 6A). In the presence of bumetanide, aortic contraction in WT mice was significantly reduced to approximately 50% of maximal contraction (EC50; PE concentration 10−6 to 10−4 M; Figure 6B), similar to SPAK−/− and SPAK−/− mice without bumetanide treatment; however, the aortic contractility after bumetanide treatment was significantly reduced only in SPAK+/− but not SPAK−/− mice at PE concentration 10−4 M (Figure 6, C and D). These findings suggested that impaired NKCC1-mediated aortic contractility may be involved in the hypotension of SPAK-null mice. SPAK-null mice show impaired response to phenylephrine (PE)-stimulated aortic contractility and bumetanide inhibition effect. (A through D) Concentration-isometric force relationships for aortic segments in WT, SPAK+/− (He), and SPAK−/− (Ho) mice (A) and bumetanide-sensitive component of aortic contraction in WT (B), He (C), and Ho (D) SPAK-null mice (n = 6 per group). ■P < 0.05, WT versus He; ▴P < 0.05, WT versus Ho; *P < 0.05, without versus with bumetanide treatment. SPAK-null mice created by targeting disruption of exons 9 and 10 of SPAK (Stk39) exhibited low BP and prominent defects in the DCT with GS phenotype, including salt wasting, hypokalemia with renal K+ wasting, hypomagnesemia, and hypocalciuria.12,21 In the kidneys of SPAK−/− mice, the expression of total and p-NCC in the DCT was markedly decreased but total and p-NKCC2 in the TAL was significantly increased. The aortic tissues in these mice also exhibited a blunted response to PE stimulation and impaired response to bumetanide inhibition, accompanied by decreased p-NKCC1 expression. These results indicate that SPAK is crucial in the regulation of vasoconstriction and renal tubular salt reabsorption. It has been shown that SPAK is expressed in both TAL and DCT of kidney tissues and can activate both NKCC2 and NCC by enhancing their phosphorylation in vitro studies.8,11,26 It was unclear whether SPAK controlled NKCC2 and/or NCC function in vivo. In this study, we found that SPAK was predominantly expressed in the cortex, especially in the DCT; therefore NCC but not NKCC2 would be its major substrate in renal tissues. The expression of total and p-NCC (T53, T58, and S71) but not total and p-NKCC2 (T96) were markedly decreased in SPAK−/− mice, further indicating that NCC is the main target regulated by SPAK. 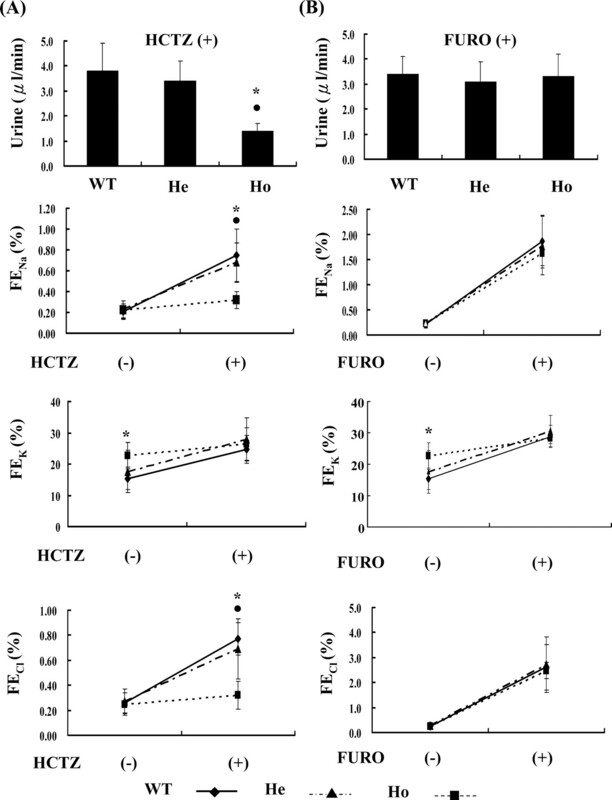 The markedly attenuated NCC but preserved NKCC2 function as evidenced by the blunted response to HCTZ but normal response to furosemide in vivo further corroborated that reduced NCC function led to GS phenotype in SPAK−/− mice. 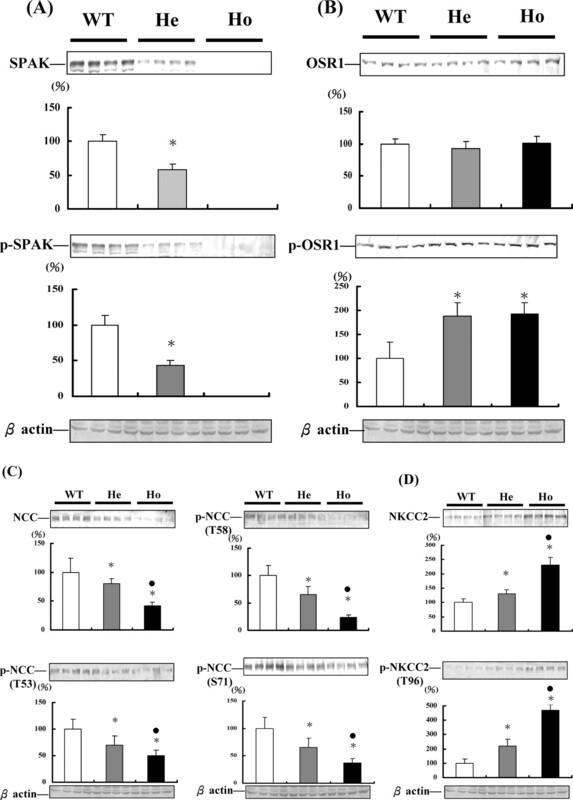 The enhanced total and p-NKCC2 expression might be caused by increased p-OSR1 expression in SPAK−/− mice as a compensatory response to loss of NCC function. Reminiscent of the normal BP and absence of GS phenotype in heterozygous NCC knockout mice,28 SPAK+/− mice with >50% total and p-NCC did not have GS phenotype but hypotension. The normal response to HCTZ and furosemide treatment in SPAK+/− mice suggested that their NCC and NKCC2 functions were still conserved. This finding hints that hypotension in SPAK+/− mice may not be primarily caused by reduced NCC function but from other effects. It has been shown that NKCC1, a downstream effector of SPAK/OSR1, can regulate vascular smooth muscle tone. Activation of NKCC1 in blood vessels leads to increased intracellular Cl− concentration, which evokes increased Ca2+ influx through L-type Ca2+ channels and vessel contraction.29–31 Drawing analogy with the reduced BP and vascular tone in NKCC1-null mice,24,25 we examined the aortic contractility of SPAK-null mice by PE stimulation, which has also been shown to stimulate vascular contractility by enhanced NKCC1 phosphorylation and activity,32 in the presence and absence of bumetanide. Aortic contractility in both SPAK+/− and SPAK−/− mice was less responsive to PE stimulation. Moreover, impaired bumetanide inhibition of aortic contractility in SPAK+/− and SPAK−/− mice was also observed. Furthermore, p-NKCC1 expression in the aortic tissues of both SPAK+/− and SPAK−/− mice were significantly decreased despite increased total NKCC1 expression. These results suggest that reduced NKCC1 phosphorylation and function in aortic tissues may contribute to the impaired vasoconstriction and hypotension in these SPAK-null mice, especially in SPAK+/− mice. In addition to PE, angiotensin II and aldosterone, the activators of the SPAK-NCC cascade in the kidney,33–35 have been shown to stimulate aortic contractility via activation of NKCC1 in vascular smooth muscle.32,36 Whether SPAK acts as an intermediate regulator between these vasoconstrictors and NKCC1 in vascular smooth muscle merits further evaluation. Thiazides, as an NCC inhibitor, have been widely used clinically as first-line therapy for hypertension. Vasorelaxing agents such as α blockers, Ca2+-channel blockers, angiotensin-converting enzyme inhibitors, and angiotensin II receptor blockers are also commonly used alone or in combination with thiazide diuretics.37 It has been increasingly shown that inhibition of NKCC1 function in smooth muscle, with resulting vasodilation effect, may be an alternative target for treatment of hypertension38; however, the high protein binding of current NKCC1/2 inhibitors (bumetanide and furosemide) means the concentrations required to achieve vasodilation through NKCC1 inhibition will be subjugated first by massive diuresis through NKCC2 inhibition.39 The dual action of SPAK portends the development of SPAK inhibitors, targeting the NCC in the DCT and NKCC1 in vascular smooth muscle, as a novel strategy in antihypertensive therapy. In conclusion, generation and analysis of SPAK-null mice shed light on the important role of SPAK in the vessels and kidneys. The total and p-NCC in the DCT but not NKCC2 in TAL were markedly decreased in SPAK−/− mice, supporting the notion that NCC is the main target of SPAK and explaining the development of the GS phenotype. Reduced NKCC1 phosphorylation and function in aortic tissues contribute to impaired vasoconstriction and hypotension in these SPAK-null mice (Figure 7). Screening of SPAK gene may be warranted for patients who have GS with only heterozygous or no detectable NCC mutations. SPAK may be a promising target for future antihypertensive therapy. 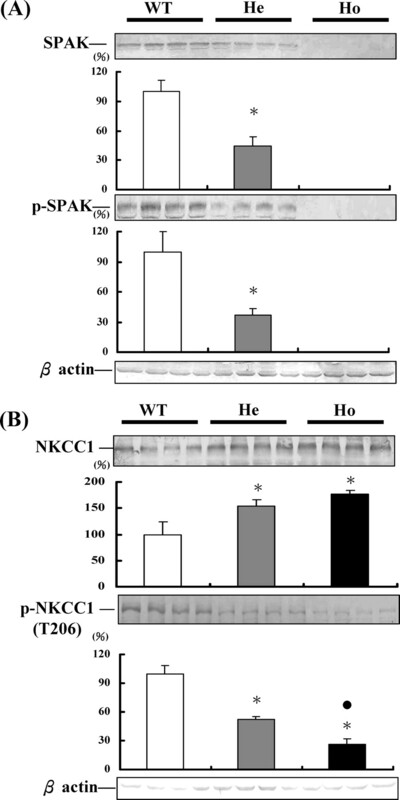 SPAK regulates NKCC1 in vascular smooth muscle and NCC in the kidneys. (A) In renal tubules, phosphorylation of NKCC2 in the TAL and NCC in the DCT are predominantly regulated by OSR1 and SPAK, respectively. In vascular smooth muscle cells (VSMC), SPAK activates the phosphorylation of NKCC1. (B) In SPAK-null mice, reduced phosphorylation and expression of NCC cause defective salt reabsorption in the DCT, leading to GS, with compensatory increased p-OSR1, total NKCC2, and p-NKCC2. Attenuated phosphorylation of NKCC1 results in vasodilation in the VSMC. The experimental protocols used in this study were approved by the Institutional Animal Care and Use Committee of the National Defense Medical Center (Taipei, Taiwan). For generation of SPAK-null mice, the targeting vector was prepared by the gap-repair technique.40 Mouse Stk39 genomic DNA encoding SPAK was isolated from a 129/Sv genomic DNA BAC library. The targeting vector was then transfected into R1 ES cells (129 × 1/SvJ × 129S1) by electroporation. After selection with 240 μg/ml G418 and 2 μM gancyclovir, correctly targeted ES clones were selected by Southern blotting. The neo cassette was excised by transfecting the Flp-expression plasmid into the targeted SPAKflox/+ ES cells. The SPAKflox/+ ES cells were again selected by Southern blotting and injected into C57BL/6 blastocysts. Chimeric males were bred with C57BL/6 females to produce heterozygous SPAKflox/+ mice. SPAK▵exon 9,10/+ mice were generated by crossing SPAKflox/+ with CAG-Cre recombinase transgenic mice.20 Homozygous SPAK▵exon 9,10/▵exon 9,10 mice were then produced by mating SPAK▵exon 9,10/+ mice with each other. WT controls and SPAK▵exon 9,10/+ and SPAK▵exon 9,10/▵exon 9,10 littermates were bred and tail genomic DNA was applied for genotyping by PCR (forward primer 5′-GCCAGCACACAACATCTGTC-3′; reverse primer 5′-TAACCCTGAAGATGGCTTGC-3′). The mice were raised in a 12-hour day and night cycle, fed with normal rodent diet (Na+ 0.3% [wt/wt], K+ 1.0% [wt/wt], Ca2+ 0.9% [wt/wt]) and plain drinking water ad libitum. The phenotype of male mice was evaluated at the age of 12 to 14 weeks. We generated an antibody to recognize specifically p-NKCC2 on Thr-96 by immunizing rabbits with a keyhole limpet hemocyanin-conjugated synthetic phosphopeptide corresponding to residues 91 through 110 [TYYLQ(pT)FGHN+ Cys] of mouse NKCC2. The serum was affinity-purified with phosphopeptide- and non–phosphopeptide-conjugated cellulose (GenScript, Piscataway, NJ; Supplemental Figure S3). Because of high conservation of the antigen, the antibody also recognizes NKCC1 on Thr-206 [TYYLR(pT)FGHN, where R is the only residue that differs between the two sequences provided]. Semiquantitative immunoblotting and IF microscopy were carried out as described previously.17 Relative intensities of the resulting immunoblot band densities were determined by laser scanning (flatbed scanner, GT-12000, EPSON) followed by densitometry using Image J (National Institutes of Health, Bethesda, MD). Densitometry data were normalized to percentage of lean mean in a double-blinded manner. In addition to our previously generated rabbit anti–p-NCC (T53, T58, and S71),17,33 anti–p-OSR1(S325)/SPAK(S383)8,18 and newly generated rabbit anti–p-NKCC2 (T96), other commercially available primary antibodies used included rabbit anti-SPAK (Cell Signaling),8,16,18 Na-K-2Cl co-transporter 2 (NKCC2; Alpha Diagnostic),42 NCC (Chemicon),17 and mouse anti-OSR1 (Abnova)8,18 and NKCC (T4).43 Alkaline phosphatase–conjugated anti-IgG antibodies (Promega) were used as secondary antibodies for immunoblotting, and Alexa 488 or 546 dye-labeled (Molecular Probes) secondary antibodies were used for IF. IF images were obtained using a LSM510 (Carl Zeiss). Intraperitoneal HCTZ (12.5 mg/kg) and furosemide (15 mg/kg) were administered, respectively, to the WT mice and SPAK+/− and SPAK−/− littermates.17,44 Urine samples in the 4 hours after a single-dose treatment were collected for analysis. Mice were killed by sodium pentobarbital (60 mg/kg, intraperitoneally). The thoracic aortas were quickly removed and placed in Krebs' solution,45 then adhering periadventitial tissues were cleaned and cut into segments 2.5 mm in length. The endothelium-denuded aortic rings were mounted in a 10-ml small vessel myograph (Myo-interface Model 610A; Atlanta, GA) organ bath filled with warmed (37°C) oxygenated (95% O2/5% CO2) Krebs' solution. The rings were allowed to equilibrate for 1 hour under an optimal resting tension of 1.5 mN. Isometric force was measured with force transducers connected to a PowerLab (AD Instruments, Castle Hill, Australia). 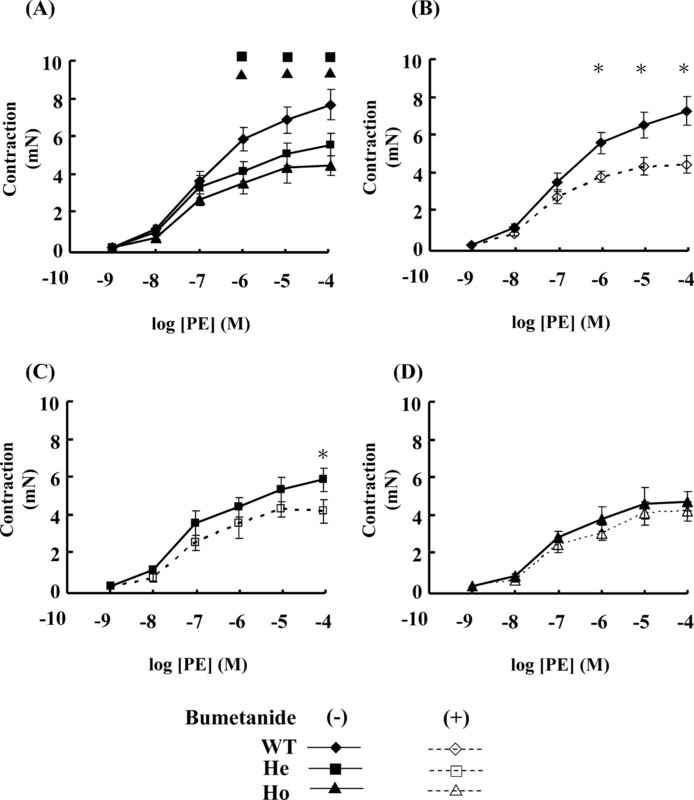 After equilibration, PE (1 to 10 nM) concentration-isometric force relationships were generated in the absence and presence of bumetanide (10 μM; 20 minutes of incubation). All results are expressed as mean ± SD. We used one-way analysis of covariance to compare the differences among the three groups (WT mice and SPAK+/− and SPAK−/− littermates). Paired t test was used to compare mice of the same genotype with or without treatment. The Mann-Whitney U test was used when the variables between two groups were not normally distributed. P < 0.05 was considered to be statistically significant. This study was supported in part by grants from the National Science Council, Taiwan (NSC 96-2314-B-016-052-MY2; NSC 98-2314-B-016-003-MY3), and by grants from the Research Fund of Tri-Service General Hospital (TSGH-C-98-83 and TSGH-C-99-096), and Japan-Taiwan Joint Research Program, Interchange Association, Japan. We thank the technical services provided by the Transgenic Mouse Model Core Facility of the National Research Program for Genomic Medicine, NSC, and Chen-Tzu Chiu for preparation and analysis of aortic contractility. See related editorial, “An Emerging Role for SPAK in NCC, NKCC, and Blood Pressure Regulation,” on pages 1812–1814.